Why the name? - one might ask. The answer is that each time you open a box of our chocolates, it feels like stepping into a secret garden. Behind each bite, You can taste and feel the fruity and floral notes of cacao, telling a different story of time and place, a story of the faraway lands of the rainforests of South America, Indonesia or the forests of West-Africa. The cocoa plantations are like huge, untamed gardens. First there are the many thousands of little bell-like flowers, decorating the trees, then later the cacao fruits vividly shining in several different colors from bright yellow, to pink or purple. And even thought it is a long way from the bean to become chocolate, for us, chocolate loving people these lands are like the garden of Eden. That’s why we choose this name, and with the choice, we also committed ourselves to let the farmers, and the communities who are cultivating and taking care of these gardens feel similarly about their work and life. And by this quote we mean that we and the Chocco Garden sweets are here to make each day of your life sweeter, cheerful and happy. Chocco Garden Ltd. was founded in 2015, but since then, it grew to a highly successful confectionery company. 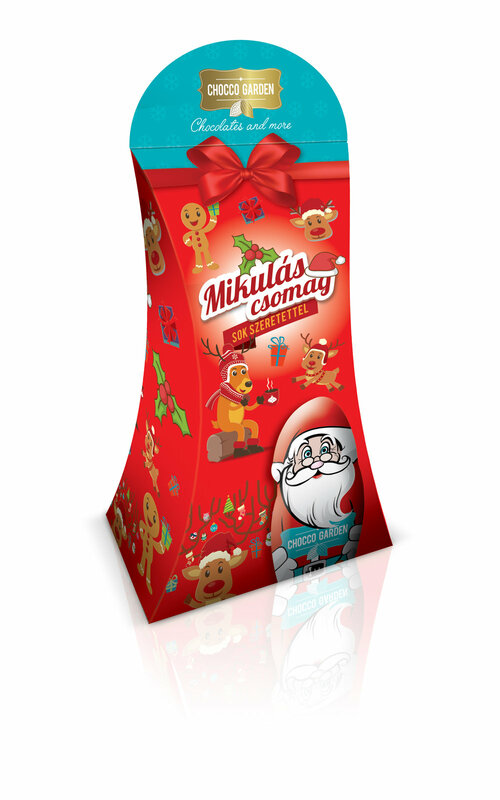 Our products – several type of chocolate confectionery, desserts, wafers, and our bubble gums - are listed in all major retail chains (international and local) in Hungary, and we make a considerable export trade as well, both in European and overseas countries. We use high-tech technology in our production, and our good quality products are all supported by trendy and innovative packaging. We provide IFS certificate for our products. Apart from chocolate confectionery, our other main line is bubble gum production, which we have a separate factory for. Our Orange Truffel Praliné has won the 2017 Valentines Day praline contest of Hungary’s biggest gastro website. Its no surprise: this thick and velvety marriage of dark chocolate and orange is simply divine. Hazelnut cream and crisp in the tastiest milk chocolate: is there any more to ask for? A piece of real cherry soaked in rum, and covered with fine Belgian dark chocolate. Serious fun for those who are serious about chocolate. Tasty egg-liquer cream filled chocolate pralines for every occasion. Heart shaped chocolate filled with banana foam and raspberry jelly. A perfect combo with an unforgettable taste. You are going to fall in love. You can express love without words, just by giving a box of these Belgian milk chocolate coins to anyone you care for. And of course. get committed yourself! Chocolate pralines – in Europe, the most popular ways to celebrate important occasions and express feelings of love and caring is to give some chocolate pralines to your beloved. No wonder that chocolate is one of Europe’s most exported food products. From ancient civilizations to space travel, chocolate is what accompanies us, making our lives better and sweeter. Chocco Garden’s Praliné Selection introduces all varieties of pralines, so everyone may find their favorite. But lets first talk about the short history of pralines and truffels. Legend says, that the name Praliné is attributed to a French soldier and diplomat, marshall César, duc de Choiseul, (His title was Comte du Plessis-Praslin) who lived in the town of Montagris in the middle of France. According to the story, it was his cook, Clément Lassagne, who invented pralines in 1636 by dropping almonds into a cauldron of boiling sugar. The original version of praline did not contain any chocolate, it was more like a cluster of almonds or other nuts in a caramelized sugar. Yummy, but very different to the Praline we know today. Which is the sugary nutty cluster grinded down to a powder, then mixing it with chocolate, cream, butter, piping into a shell of chocolate to form a Belgian Praline which is the basis of all the modern chocolates that are called Pralines in Europe. Snack in an instant: taste our large wafer bars and choose your favorite! Instant cocoa powder with 6 vitamins and minerals (vitamin C, vitamin-D, tiamin, magnesium, zinc, iron) for a fresh and energetic morning. Heavenly smooth formula in two packaging sizes (200 g, 700 g). Wellness comes in 3 varieties! Wafer rolls covered with chocolate and filled with hazelnut cream. To take you through the day! Law fat cocoa powder for those, who love baking. Assorted chocolate pralines with rum cherry and advocaat filling, in elegant metal boxes. Our chocolate products with the figures of the latest ICE AGE movies are childrens favorite. A pretty carton box for the winter season.